Can Dragons Be Spirit Guides? I've always loved dragons, I've gotten numerous requests to write about dragons, and personally I have a dragon as one of my power animals. But dragons and angels? It never really seemed to be a good fit to write about dragons here… So I was a bit surprised, but definitely excited today when I asked the angels what they wanted me to write about, and they said “Spiritual Dragons”! Now that I'm committed to sharing what I know about dragons (because I'm committed to following the guidance of my angels), it totally makes sense. Dragons are not confined to the realms of stories and myth like some people may think. Dragons really exist, although they do so in spirit and not in physical form. Dragons did in ancient times walk upon the Earth (and other planets) as physical beings… But they ascended beyond the need for physical bodies. As a quick side note here, not all of the dragons ascended. Some did descend into lower vibrational realms of existence (yes there are some planets with even denser vibrations than Earth). But for our purposes, we have no need to connect with the lower vibrational dragons. And so as loose definition in talking about “Spiritual Dragons”, we're talking about the dragons who through living in light and love, have ascended into the realms of spirit. The Ascended Dragons are powerful spiritual guides and teachers. I guess you could say that Spiritual Dragons are the ascended masters of the mythical power animals. There are of course more in this category, like the Unicorns for instance… From my experience, ‘Mythical Power Animals' are a group of souls who stand in the light, serve the Divine, and seek to empower humanity in understanding spiritual wisdom, magic, and the infinite possibility available to us now. Dragons do just this, and they're stepping forward now to help more and more lightworkers to accomplish their purpose. Dragons are magical spiritual beings, who seek to empower humanity physically, mentally, spiritually and emotionally. By helping us to see through illusion, the Spiritual Dragons know we are able to return to understanding and embracing our I Am Presence, and experiencing our full connection and oneness with the Divine and with all of existence. Dragons are effective and powerful spiritual protectors as well as teachers and healers. They are masters of the Earth elements, and through this they can help us to heal ourselves and others, understand Earth magic, remember the ancient mysteries, and to see through the illusions present in our modern lives. When you think of Dragons do you get the visual of a fire breathing Dragon? The Dragon's fire is a sacred spiritual tool which can serve to transmute negativity, and to ignite the alchemical fire within you. The Dragon's fire has the ability to burn through the veil of illusion, and to transmute fear, and density to reveal the underlying light and truth. Illusion is often all that blocks us from creating blessings in our individual and collective experience, and with the Spiritual Dragons as allies, we can learn to see past illusion to reclaim our full power as spiritual beings here to create positive change in the physical. The Spiritual Dragons are happy to help all those who call upon them with pure intentions, and while they're incredibly powerful, they're big on empowering you to take responsibility. They'll also give you little tests to see if you've learned the pre-requisites before helping to open you to a new level. 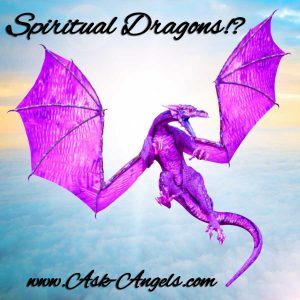 Do you have a dragon on your spiritual team? If so, they're more than happy to share insight, wisdom and healing with you to empower you to grow spiritually, to make positive choices to improve your life, and to accomplish your purpose as a lightworker and spiritual being here on Earth. Not sure if you have a Dragon guide? In the recent How to Receive Angelic Guidance Angel Course you will learn a simple process to tune into your team of guides and angels. Click Here to learn more about this course! PS. Do you have a Spiritual Dragon on your team? Was this article interesting? I love hearing from you… Be sure to leave me a comment below or on facebook and let me know! Animal Spirit Guides… How to Meet Your Power Animal! I was working on my daily clearing of energies and healing negativity and blockages etc. when I suddenly got a vision of a dragon in flames, it was purifying itself with its own fire. I couldn’t help but think it was connected to me, or maybe be part of me (a vision of the scorpio rising from the ashes came to mind too, as that is my zodiac sign this lifetime). However the case, it feels like something I should connect more to. Reading this article made me think that even more. Thank you. I was seeing shapes of a dragon in the clouds it was more than 8 of than and been seeing it for 2 days straight. Although it was unclear that I’m trying to figure out why it constantly appeared tho I’m been looking for answers. Not feeling well, I cancelled all of my appointments for today and decided to go back to bed……I then had a dream in which there was a dragon (with male anatomy) sharing my bed with me – this male anatomy kept pressing against me and I recited the Lord’s prayer three times – at the end of the third time, I was aware of an exceptionally bright light coming into my dream, from the top left hand side……..I did not feel scared…..the dream dragon than looked at me and said….so you’re not scared of me…..and I replied…no, I’m not scared of you…..the face of it was somehow familiar but I can’t say how or why……….what does this mean please? I am by the way, someone who carries out energetic healing via a variety of healing methods. i want to know about this dream…. by my experience Dragons have pretty unique personalities and tendencies. They are as individual in their attitudes and the ways they present themselves as people are. So, unfortunately the best advice might be to first contemplate what it felt like this might mean through some personal reflection. One thing that is apparent among dragons is that the things they do might be strange or unconventional at times, but it isn’t really ever without a purpose or goal. Maybe to give a start or a bit of shock to make a message memorable. Or to bring attention to a particular set of thoughts or questions. Or to a personal challenge or fear. Or maybe something as simple as for an impish laugh through a bit of mischief. Explore how the dragon’s presence and.. err… presentation made you feel. How was it familiar? Did it begin with surprise/fear, or were you comfortable with the event right from the start? Did it come across as something meant to be more symbolic, such as revealing himself to you in full, with nothing hidden… Or was it more like a flirtatious/provocative introduction? I wouldn’t narrow out the latter off hand either. Dragons often have an appreciation for intimate encounters, to the point where one could presume to think it was their equivalent of handshake! Or at least as a way to pass the time, akin to passing an afternoon playing cards. In the end, the best way to puzzle this out may be to simply reach out and ask the dragon directly what the encounter was about with a direct question or two. I have a spiritual dragon. Since my Zodiac sign is Pisces, I have always felt that I have a water dragon spirit guide (often the element of your zodiac sign is similar to the element of your spirit dragon, at least I have learned so). me, guide me, and give me wisdom. Love the article. Been doing a lot of digging into this topic, as I’ve had a couple “visits” of a dark purple dragon. I saw him initially during some bathtub meditations and later speaking one of my higher selves. Also while gridding my property during a meditation, after it was glowing i saw a green wingless dragon kinda roll over and give me a lazy cat nap look. Always open to tips, as there is not much on this topic. I had a spontaneous kinda link awakening this last January and saw, what looked like a few dragons at once. Although, most likely not most would imagine. They weren’t solid. . It was like I could see their outline and their teeth. Idk. Anyways, email please if you have anymore information. You seem legit. Recently I’ve done a meditation to meet my spiritual guides and through it I did found out that one of them is a Water Dragon called River. Also found out that he looks just like my first channeling drawing I’ve done few month ago. Once I realised what was going on I cried hard. Such an intense feeling, body was somewhere in space feeling like it was cut in half. Quite hard to explain the sensation. Since then I stated to research more about dragons and that why I bumped into this article! I am so glad I came across this site, one that finally allows others to comment and share to experiences. Born from a long line of shamanic healers, I was a gifted child, but evil forces have always plagued me trying to stop my light and I became shared and refused my spirituality for logic and reason…of course becoming lost and experiencing a dark knight of my soul for 10+ years. About 5 months ago I began reawakening to my higher self and unraveling from the darkness, no longer afraid of the evil that may lie ahead though I sensed it, I felt stronger than it. I was no longer a child, it could no longer send demons and gouls to scare me in the night. Yet I still was lost and obsessively trying to find who I was as I reawakened, looking externally vs. outside of myself. Until my dream one night, which I know now wasn’t a dream. I woke up out of body, hovering over my bed. I could still see myself and husband lying beneath me and my room in tact. Cloaked beings pulled and scratched at my spiritual body trying to pull me with them (as they always have), but I was amendment that I was not going with them. Next thing I saw was a shield and sword in my hand and outnumbered I fought these beings as well as I could off of me. Below I saw my body convulsing in bed, rolling around and smashing side to side as my physical eyes rolled in the back of my head. Though I was able to attack many of my assailants, the sheer numbers of them were far too hard to fight off and I knew from viewing my physical body below me – that it would struggle to survive such attack. Out of nowhere an enormous serpentine style, two headed dragon rose up behind my attackers and blew a circle of fire around my attackers, as well as at them while they were enclosed. I looked in utter shock as I watched my attackers be executed by the fire breathing dragon and wanted to thank him for his servitude, but instead the dragon slammed me back into my body to get out of it’s way and get back to safety & I felt that slam as it was an extremely intense feeling that nearly caused me to jump right out of my bed, gasping for air. Prior to this during my time period of ignoring all spirituality and mysticism, I thought dragons were simply a cheesy myth , the brain child of fantasy novels. I never experienced one in my life, nor was I drawn to them in any way ever. I would’ve chalked this all up to a dream with logic and reason, but the thing was – my body was indeed damaged. I was an agonizing pain and could not move my neck, shoulders or arms. It literally felt as if I were beat to a pulp and almost as if my upper body was near paralyzed. The damage was so bad that all I could do was lie in bed unable to move, bed ridden, for the next two weeks. Clearly an accident had happened that night and it wasn’t just something I imagined. I know with absolute certainty that I am a lightworker and owe a great debt to the dragon who protected me that night from the evil who was angered by my choice to step once more in the light. I now know my fallacy of thinking dragons were some cheesy mythical creature and am grateful to now know far better now & to have been protected regardless of what I previously believe. This has been a new, deep, spiritual chapter in my life that I have only began to take the first baby steps of embarking on, but I will forever pay homage to the great dragons of wisdom and protection and I look forward to meditating and further developing on my life path with them by my side. What if your spirit is a spiritual dragon itself? I don’t know why I’m writing this but I want to share issue regarding this spirit dragon. ……I began to see this dragon at the age of 22 since den its not getting apart from my eyes……special at night I can see him cleary with golden colour body golden colour scale….its beautiful to watch him…….. all I want to is that why he came to my life as a living spitit in my eyes……….. I have recently awoken to my spiritual gifts including claircognizance which has led me to find a spiritual mentor that practices shamanic journeying. Through her guidance I have learned how to journey safely myself and connect with my spirit team! One day my mentor suggested I journey to meet my spirit helper who can help me decipher the messages I receive in my dreams. I rode my pegasus right into a dragon den and met my first spiritual dragon! (And he tested me!) The most interesting part was that I had a dream where I was looking at an iridescent crystal several days before so synchronicity had me buy a Labradorite before the journey. In the journey I learned the dragon had planted that dream in my subconscious and the crystal was one of his scales ??! I love this new world! Thank you for spreading love and light!!! So I have been seeing dragons everywhere since the start of the new year. But not in TV it in dreams, but a rock will look like a dragons head, or a pile of clothes will be shaped like a sleeping dragon. But EVERYWHERE. In snow mounds, in clouds. I want to invite my dragon to my dreams. But I wish I knew how. Your learning to see. These dragons are playing a game of hide and seek with you. They are predators, after all. Instead of asking for a name, ask for what you can call it. Some creatures do not share their real name with others, but will give you something to call them. Sometimes we can’t pronounce their names either. I have been a dragon in a past life. I’ve known of a coyote being in my life for about 6 years now, a lioness for 4, and recently… I’ve felt drawn to dragons. After looking them up, I felt the presence of one. And.. I’m certain I recognize his presence. As if he’s been here before. It’s wonderful. The jump from lions/lionesses to dragons isn’t uncommon. They have many similarities including deep respect for eachother. Recently I had a very powerful lucid dream where I saved 2 baby dragons. The first started out as the image of a koi fish trapped in a vehicle and I could not stop myself from feeling it did not belong there so I went to the vehicle and reached in against the advice of some friends I was with in the dream who were also friends in the physical world. I began rubbing it’s head while thinking to myself it might take my hand off. It began rubbing against me like a puppy who was waiting to receive love I cuddled it in my arms and realized its form kept changing. I brought it into the woods and it sunk into a puddle in the earth. I later came back to check on it and it came out of a dark space under the roots of a tree and greeted me like we were friends. The other was a purple baby water dragon. I met it on a beach and immediately connected. I felt so much love for them both but this one was more playful. There were people trying to kill it and it got really sick and I did all that I could to save it and I ended up cleansing it with water. It was so willing to connect with me and I felt an unconditional and protective love for it as I released it back to the ocean. I looked up dragon dreams but can’t find anything related to baby dragons and saving and nurturing them. Any thoughts??? Lady Grey, my Carpathian Dragon. She is magnificent, powerful and has a sense of humour! I love her! This is so coincidental! Recently, during meditation I had a dragon step forth to support me. She transforms my fear into power. I named her Esmeralda. I haven’t really worked with her much yet, but I have a feeling this blog is my sign to work with Esmeralda. Believe me, I never anticipated this. My meditations are great, but nothing otherworldly usually. Cool. Thanks so much for posting your knowledge on dragons! Thanks to your angels too! Yes, I do have a Dragon Power Guide, I asked it’s name and it said, Sacred Fire!! Several years ago as I was awaking one morning, and still in in a state of being half asleep, I saw a tiny green dragon hovering near my face for only a second. I had never been into dragons before, so I was astonished to have this encounter! After that I kept seeing images of dragons everywhere . . . on people’s t-shirts, clouds that were PERFECT formations, etc. I haven’t seen one since, but I know my dragon is out there somewhere looking out for me. Thank you for this article, which is a nice confirmation, and I enjoyed reading the comments, too! I meet my dragon and he said his name was ki ( what mean spirit of a water dragon) but that all. I would like to learn more about it, but can’t find much on it. this is the first time that i come on this website, i stumbled on it randomly in a facebook group about dragons. i totally agree with this article – dragons are real and deserve the highest of respect. i have a dragon guide and a guardian, and feel grateful those two stick to me in my spiritual learnings. they have been very helpful so far, and i hope to honour them for the rest of this life on this Earth. and i have seen also a dragon in the cloud, on a cold winter afternoon – it was magnificent and a very powerful message of listening what they have to say, that they are really here to help us ^_^ thanks for sharing with us! Some 20 years ago I was visited by a Dragon whilst I was in mourning for my father who had just passed. I was sitting in the lounge room by my self & a large door opened on a blank wall & he stepped through. I was stunned & just sat there gaping at him. He was over 2 metres tall Black with a central crest of gold & large folded wings. He laughed at me & said I had to come with him through the door, I got up & went through the door into an infinitely long corridor lined with doorways. Beings of all shapes & sizes were going through the doorways & travelling between them. He said that I had much to do in this life if I expected to take my place in the way between the worlds & I had to stop mourning my father who was now much happier where he was & get on with my own life. He ushered me back through the same door & talked to me some more & then left. I went to bed & when I awoke in the morning I assumed that it had been a dream, however when I went into the lounge room there were scratches on the floorboards such as you would get opening a door that scraped across the floor. I have a dragon guide. 🙂 Thank you for this article. Many years ago I met him whilst meditating and he felt like a teacher, a guardian. One day I drew a picture of him and later when I went to meditate and connect with him, I couldn’t connect, he had moved on. He told me he was needed elsewhere and that he would still be with me if I called him. Jumping forward at least 15 years, I was having a reiki 1 attunement and silently summoned him to be with me. Afterwards, the reiki master turned to me and said there was an elemental guide with me. I knew it was him. A wonderful confirmation for me. I think I do have a dragon i saw in my dreams as a vision I was very disappointed and full of melancholy and so much sadness then I saw dragon a black dragon with orange bright eyes …I got afraid but I tried to google what I saw in my dream and I did found the image and since then I find images and pics in my newsfeed in my Facebook account as a sign that he shows his presence that he is here for me…its a black huge Dragon comes in my vision a voice told me within me its a warrior dragon comes for my protection….I hope I am not loosing my mind or going crazy ….thank you for sharing your article because I need to know if this is truth or just fantasy my mind is creating. Thank you for posting about dragons. I have a dragon, but never knew his purpose with me. I wanted to know how to get to know him. I would love seeing more things about dragons. I have loved dragons for many years, I also love dragonflies. I seen a dragon in the clouds. I didnt know what to make of it. What does it mean to me?